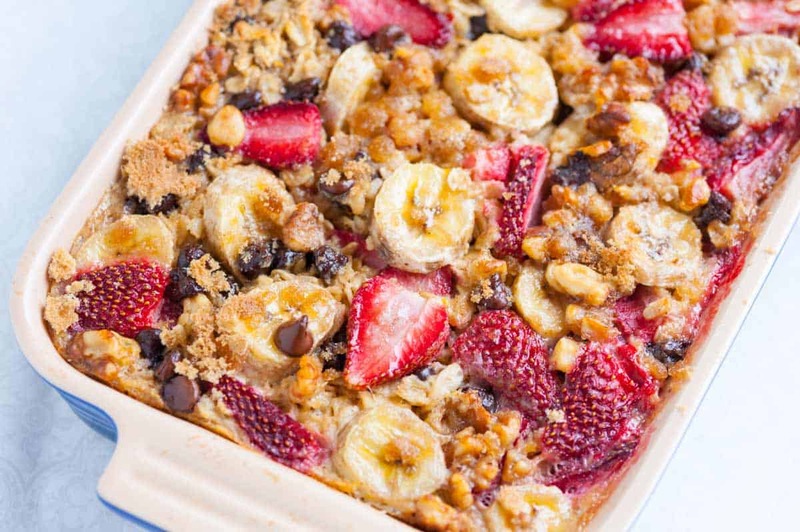 This extra easy baked oatmeal recipe with fresh strawberries, bananas, and chocolate is one of our favorite things to make for breakfast. Make it in the morning or assemble the night before and bake the next day! Jump to the Baked Oatmeal Recipe now or watch our quick recipe video showing you how we make it. Great for crowds, our Easy Vegetable Frittata might be one of our favorite dishes. Here’s another baked oatmeal recipe for you. This one has blackberries and a simple caramel sauce spooned on top. 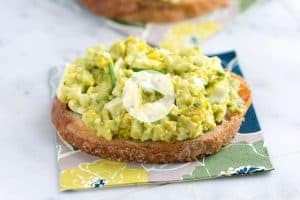 If you love scrambled eggs, this is the only way we make scrambled eggs in our house. They are creamy, soft, and delicious. A side of bacon is never a bad idea, here’s how we bake bacon in the oven so that it’s crispy and perfectly cooked. Another crowd pleaser: Breakfast Enchiladas with Ham and Peppers. There’s something special about entertaining in the morning — it’s casual, laid back and really can start the day off right. This easy baked oatmeal is where we turn when there are more than the two of us in the house. It’s really flexible. Feel free to play with the add-ins to our recipe. We love adding strawberries, banana and chocolate, but add whatever you love. Or, add that odd amount of nuts, raisins or cranberries left in your pantry from another recipe. It’s up to you! If you take a read through the comments below, you’ll see so many who have shared this baked oatmeal recipe with family or friends. Some have even taken it to work. You can mix all of the ingredients the night before cooking and then bake in the morning. If you do this, place bananas on the bottom of the dish and not on top of the oats since they may brown slightly over night. Some readers have tried freezing the oatmeal: After mixing everything together, tightly cover the oatmeal or pour into resealable plastic bags and freeze for up to one month. Then, when you want to bake the oatmeal, just remove from freezer, thaw and bake as directed. If you decide to do this, we suggest that you mix the fruit into the oatmeal instead of placing on top to prevent browning – especially the bananas. You may also like these Easy Homemade Blueberry Muffins from scratch. We make them in one bowl in under 30 minutes. 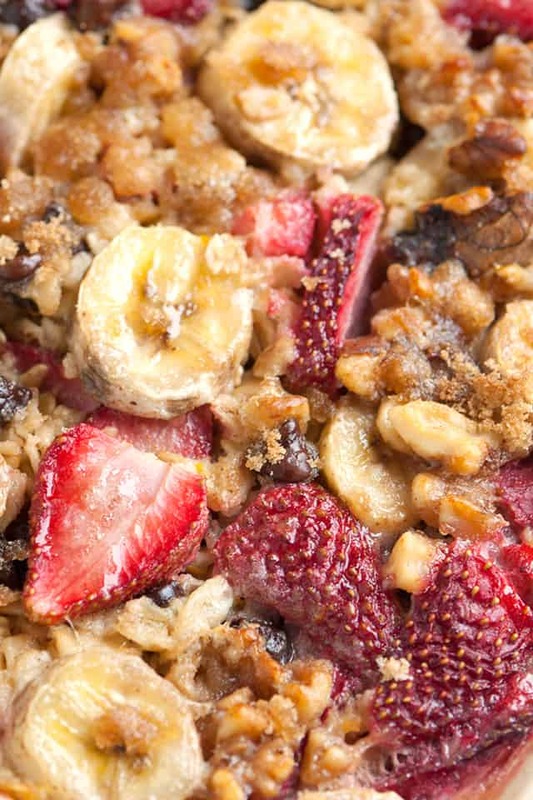 This baked oatmeal recipe is easily adapted for dairy-free and egg-free diets. While we call for one egg in the recipe, we have had success removing the egg completely. Another easy substitution is replacing soy, almond or even coconut milk for the milk called for in the original recipe. Finally, if you wish to reduce the amount of sugar, readers have had success eliminating the sugar all together. You could do this or replace the sugar with honey or agave nectar. 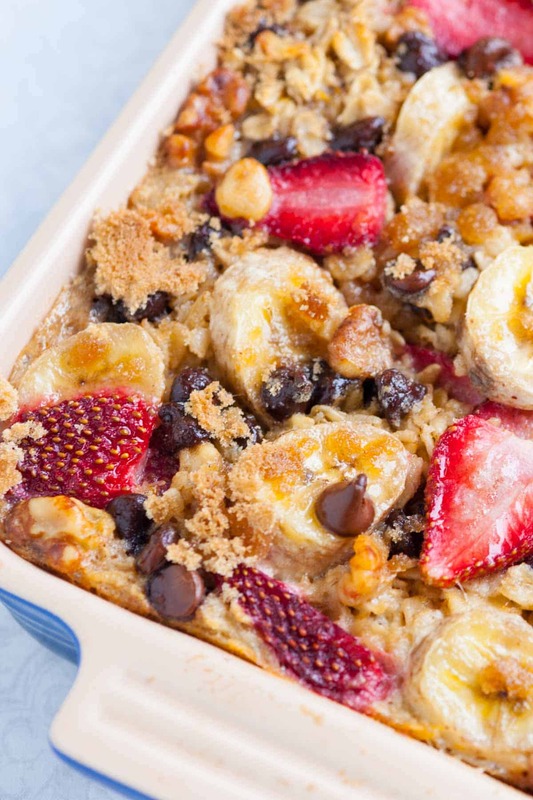 Our extra easy baked oatmeal recipe with fresh strawberries, bananas and chocolate is such a crowd-pleaser. You could make this in the morning or if you’re short on time, prepare it the night before and bake in the morning. There are lots of substitutions you can make, here. A few ideas: replace the milk with soy milk, remove the egg, reduce sugar a little, or change up the fruit, nuts and chocolate to something you love. 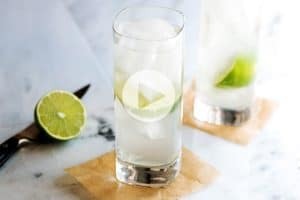 We talk a bit more about recipe substitutions in the article, but you can also read below in the comments to see what others have done. Heat oven to 375 degrees F. Generously spray the inside of a 2-quart baking dish with cooking spray and place on a baking sheet. In a large bowl, mix together the oats, sugar, baking powder, orange zest, Chinese five spice, salt, half the walnuts, half the strawberries, and half the chocolate. Add to prepared baking dish. Scatter the remaining strawberries, walnuts, chocolate, and the banana on top of the oats. 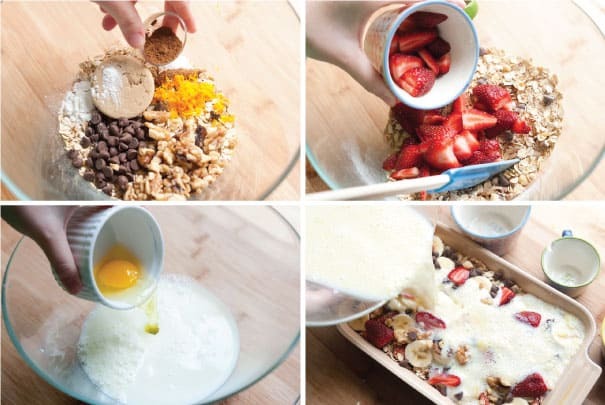 In another large bowl, whisk together the milk, egg, butter, and vanilla extract, then pour over the oats and fruit. Gently shimmy and shake the baking dish to help the milk mixture go throughout the oats. Bake oatmeal until the top is golden brown and the milk mixture has set, about 35 minutes. For an extra tasty top, sprinkle a tablespoon or so of brown sugar on top of the oatmeal, and then place back in the oven under the broiler and broil for 20-30 seconds. For gluten-free oatmeal, use certified gluten-free oats. Hi i”m a diabetic would it be possible to use other types of sugar and how much . Hi Alexandra, Yes, you can use alternative sweeteners. I’d go based on your tastes. You could always leave out the sweetener altogether and then sprinkle the baked oatmeal with something (honey/stevia/whatever you usually use) based on your tastes. If I want to bake this in individual ramekins, will the bake time change much? Hi Megan, The bake time will be a bit less. I’d keep an eye on them while in the oven and take them out when the oatmeal has set. 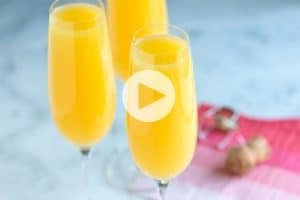 This is one of my favorite recipes!!! We always make this before a weekend of skiing – it makes getting up really early so much easier. 🙂 If I mix it up the night before and leave in fridge to cook in the morning. Should I reduce the cook time? Does consistency change a lot? Nothing should change if you make it the night before. Could I substitute steel cut oats if I soaked it overnight? Hi Dianne, This should be fine. Hi, How long would this last in the fridge after it is baked? Thanks! If covered, the baked oatmeal should last up to 3 days. Tried it almond milk and it was delicious! Next, will try without the egg. Thanks for the recipe! 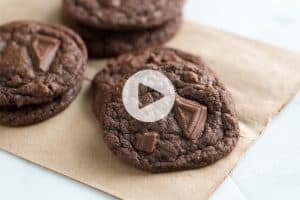 I was wondering if I doubled this recipe would it fit in a 3quart glass cake/brownie baking dish? Hi Katrina, You should be fine. I have never liked oatmeal, except for oatmeal cookies, But I am certainly going to make this! Thank you for your delicious creativity! Funny thing about Walla Walla… I recently came into possession of a converted hippy school bus camper/motor home, with the home location of Walla Walla painted on the porch in the rear! Yep! Creative people out your way! So glad you are trying out the oatmeal and how funny that Walla Walla was painted on the porch! You can definitely double it and I think a triple batch will fit (but it will be to the top). Hi Beth, This can absolutely be frozen. I prefer to bake it, cool it then freeze. You could even freeze into smaller portions. Hi there, Frozen berries are an excellent alternative. I’d add them frozen. Can it be frozen and reheated at a later time? Hi Kira, Yes! You could even freeze in smaller (individual) portions. I have made this many times because it is so good. I have often wondered if I could use steel cut oats. Any thoughts? Hi Dianne, Steel cut oats would be great! The texture will differ slightly, but it should work really well. Can you reheat it the next for left overs? Or is it only good the morning you make it? Hi Crystal, the leftovers are delicious. Simply reheat. How many calories per serving? Anyone know?